Could My Best Furry Friend Have Kidney Disease? As a dog parent, the best time to learn about the potential signs and symptoms of kidney disease is before those signs appear. This is easier said than done, but it is incredibly important. The kidneys are vital to your dog’s health, so any decrease in their ability to filter waste from the blood stream requires quick action on your part. 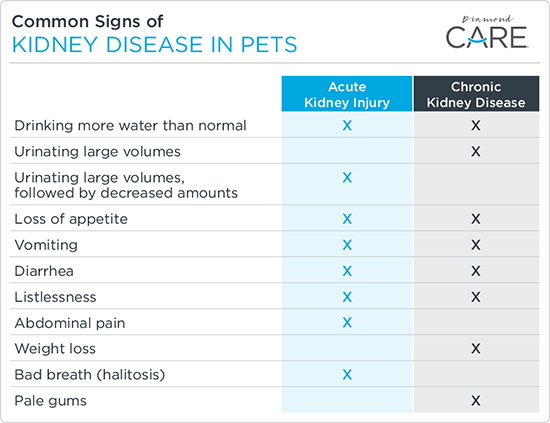 You should know the signs, but also be aware of the challenges of recognizing signs of canine kidney disease. Although some breeds can inherit or be born with conditions affecting their kidneys, these cases tend to be rare. Any dog can develop kidney disease, which may take the form of acute (sudden) kidney injury (AKI) or chronic kidney disease (CKD). Sometimes, the two conditions coexist. Part of the challenge of recognizing kidney disease in dogs is that dogs may not show any signs of illness in the early stages of the disease. And by the time signs of a problem are apparent, 66 to 75 percent of the kidneys’ function has been lost. Another hurdle to recognizing kidney disease is that the signs seen by pet parents are nonspecific, meaning they can also be associated with other health problems. So what’s a pet parent to do? Because the signs of kidney disease you may notice can be indicators of other health issues, it’s important to have your dog routinely examined by a veterinarian, and it’s especially important to have your canine companion evaluated if you see any of the signs mentioned. Your veterinarian may find additional indicators of kidney disease on physical examination, such as sores in your dog’s mouth (oral ulcers), dehydration, changes in the retina of the eyes or abnormally sized kidneys. Diagnostics such as blood and urine tests, X-rays and blood pressure measurement will provide your veterinarian with a more complete picture of your dog’s health, help him or her diagnose kidney disease if present and create a treatment plan to manage your dog’s condition. RELATED POST: What’s the Difference Between Acute and Chronic Kidney Disease in Dogs?